ChangeLab Solutions has developed a suite of 3 products (a fact sheet, literature review, and infographic) to provide an overview of the positive health effects of paid family leave (PFL) for families, young children, and new mothers. Time off to care for very young children has many health-related benefits for mothers, children, and families—for example, increases in health benefits associated with breastfeeding, better mother-child interactions, and decreased maternal and marital stress. Paid leave, in contrast to unpaid leave, has been shown to reduce infant mortality and to improve other health outcomes for children. Many workers must balance pregnancy or caregiving for young children or other family members with work responsibilities. Only a small percentage of workers have access to state-provided or employer-sponsored PFL, making it difficult for people to attain their full health potential. Moreover, low-income employees and workers of color are the least likely to have meaningful access to PFL, a fact that raises serious health equity concerns. The new publications illustrate the health equity implications of PFL. The fact sheet highlights the key health benefits of paid leave for newborn and young children, for new mothers, and for whole families and also provides an overview of the equity-enhancing components of current state PFL laws. The literature review includes a more in-depth summary of the public health literature emphasizing the health benefits of PFL. The infographic provides a visual summary of the health benefits of PFL discussed in both the fact sheet and the literature review. For more information on other workplace policies that support health equity, please contact us. Learn more about how you can support our work! Shauneequa Owusu is a senior vice president at ChangeLab Solutions, where she leads the development of strategies and approaches to improve the health of communities across the nation. Shauneequa’s passion for urban policy and community development has fueled her work in a range of settings from local government to national nonprofits. She was drawn to join ChangeLab Solutions because of our multidisciplinary approach to developing policy solutions. “Law and policy leverage change; they are at the core of everything,” she states. Over 18 months, ChangeLab Solutions will work with a network of local governments and community-based organizations. We will develop new products, deliver tailored technical assistance, and work intensively with a cohort of 8 selected communities to build their capacity to use the tools of law and policy to build healthy, equitable communities. Given the project’s focus on health equity, topics include food insecurity, the built environment, public financing, maternal and family wellness, or community and school health. The 8 communities in the cohort comprise a diverse cross section of the United States, representing the West, Midwest, Northeast, and South as well as rural, urban, suburban, and tribal communities. Read more about Shauneequa and her work to improve the health of children, families, and communities. Learn more about how ChangeLab Solutions can help improve the health of children and families in your community, and support our work to build healthy communities for all! California Governor Jerry Brown has signed Assembly Bill 841, which prohibits schools from marketing foods that cannot be sold or served in those schools. The addition to the state education code is based on the idea that unhealthy foods that may not be served to students should not be advertised to them, either. The law also prohibits schools from participating in corporate incentive programs that reward students with free or discounted foods or beverages that do not comply with applicable nutritional standards such as the USDA Smart Snacks in School regulations. Marketing of junk food to children is big business. The Federal Trade Commission has reported that companies spend $149 million annually on food marketing in schools. Such marketing adversely affects students’ eating habits, which are tied to their health and their academic success. AB 841 was substantially based on a model policy created by ChangeLab Solutions. We also acknowledge and thank the American Heart Association and Public Health Advocates for their instrumental role in the passage of AB 841. The passage of AB 841 makes California one of the first states to pass legislation addressing the marketing of unhealthy foods to children in schools. This law will help ensure that students receive consistent messages from their schools about the importance of proper nutrition as well as reinforce parents’ efforts to help their children choose healthy foods. In addition, helping students make healthy food choices will result in healthier students who are better able to thrive academically. ChangeLab Solutions has created a fact sheet on restricting unhealthy food marketing in schools as well as model policies with language for district-level policies and state-level statutes that can be tailored to the needs of particular jurisdictions and then adopted by school boards, state boards of education, or state legislatures. Contact us to learn more about how to regulate marketing of unhealthy foods to children in your schools! Great news from the New York City Department of Education! Serving over 1.1 million students, the initiative is now the largest universal free lunch program in the nation. Other major cities leading the way include Boston, Chicago, Detroit, and Dallas. ChangeLab applauds NYC DOE’s efforts toensure that all students are healthy and ready to learn. To learn more about creating healthier, thriving school environments, contact us or check out our resources. Communities with many tobacco stores — and many stores near one another — often bear the brunt of tobacco use. Greater concentration and higher numbers of tobacco retailers, as well as retailers’ proximity to schools, have been associated with higher rates of youth smoking, higher rates of cigarettes smoked per day, and lower rates of quitting. Low-income areas and areas with many African American or Latino residents often have more tobacco stores — and more of them packed together. Not surprisingly, these communities suffer most from the negative health effects associated with tobacco use. Reducing the density and number of tobacco retailers is a promising strategy for decreasing tobacco use, curbing exposure to tobacco marketing, and promoting health equity. We partnered with CounterTobacco.org to develop an easy-to-use infographic, How to Reduce Tobacco Retailer Density and Why, to illustrate 5 ways communities can reduce the number and density of local tobacco stores. 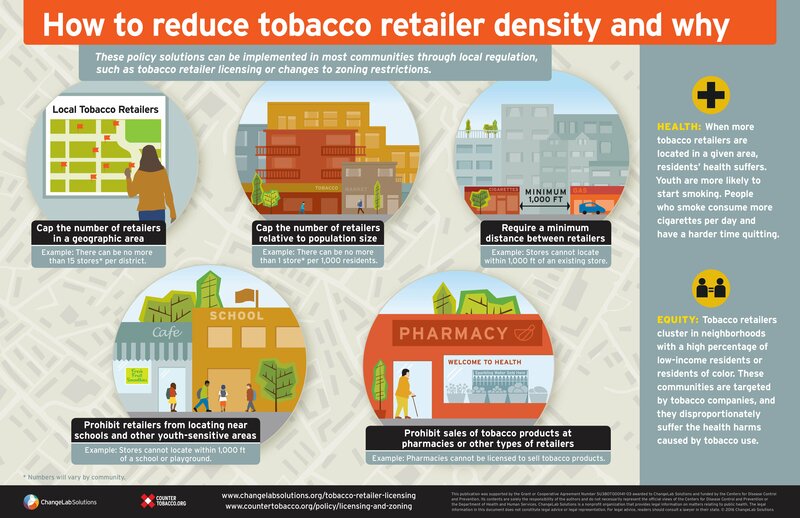 Residents, advocates, and decisionmakers can use this infographic to learn why addressing tobacco retailer density is important and to help them pick the best strategies for their community. Check out the infographic and our related resource, the Tobacco Retailer Licensing Playbook. We are also available to provide technical assistance to state health departments working on tobacco retailer density or other tobacco control strategies through tobacco retailer licensing. To stay current on our tobacco work, subscribe to our emails and contact us to learn more!